With the onset of longer nights and cooler temperatures, millions of adaptations click into action that prepares plants for a less active or dormant state. By no means do we understand all these complex chemical messages our gardens are generating, but there are some ways we can support their efforts to survive the winter. Here are a few common garden mistakes that gardeners make in the fall, and the reasons we don’t want to do them. There is even a little chemistry included for those fascinated by the secret workings of nature. The reason we fertilize in the spring and not in the fall is plants aren’t growing and you don’t feed something that isn’t hungry. They don’t want that food because sunlight is diminishing and the plant “senses” that it is time to quit growing, sit quietly, and depend on its stored reserves of energy. The whole system relies on chloroplasts, which exist in the plants’ cells, gives them a green color and has the amazing ability to capture light rays and store these as energy in sugar molecules. It’s all about chemical bonding; energy from the sun’s light rays is captured and then moved to molecules, and then to other molecules, which build new ones and break others down. All that energy comes from the sunlight, captured in the chloroplasts. Sugars and starches and other nutrients are produced, which pretty much support life on earth. So, if we feed plants in the fall when they can’t utilize the nutrients, particularly nitrogen that stimulates new growth, we are going against their natural protections of creating tougher tissues that withstand icy temperatures. The second reason we only fertilize when plants are hungry is that if plants can’t utilize the nutrients, they will leach or move these excess nutrients into our valuable water supply system. And, remember, these nutrients should only be applied if a soil test indicates a need. From April through November the soil tests are free at the North Carolina Department of Agriculture and Consumer Services Agronomic Division—ncagr.gov. There is a peak-season fee in the other months. Take advantage of the service and use fertilizers efficiently. 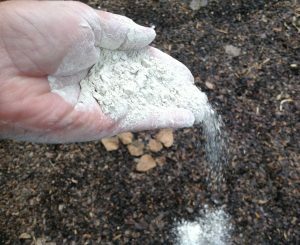 If recommended on the soil test, fall is the perfect time to apply lime as it takes months to react in the soil. The reason we apply only a 1-3-inch layer of mulch and not 6 inches deep is because plant roots have to breathe in oxygen and they can’t get it when they are smothered under a thick blanket. 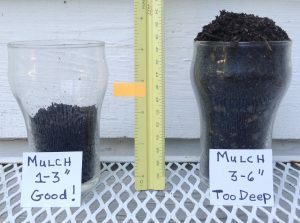 Mulching is a great practice—it prevents weed seeds from getting the sunlight they need to stimulate germination, it holds in moisture, and keeps the soil a more even temperature. So why do roots need oxygen? They need oxygen to utilize the stored energy. Since most of the oxygen production occurs in the leaves, roots need to pull in oxygen from their surroundings. If the mulch is too thick, air movement into the soil pores is reduced and roots will not grow and thrive. The reason we don’t let plant roots dry out before a hard freeze is because more damage occurs to roots when they are dry and frozen, than when they have adequate moisture and freeze. Usually we think of soil and plants drying out in the warm summer months, but winter winds and lack of rain can put a plant into severe drought stress. Add freezing temperatures and the root cells are vulnerable to the ice crystals that form within the plant tissue and destroy the cells. 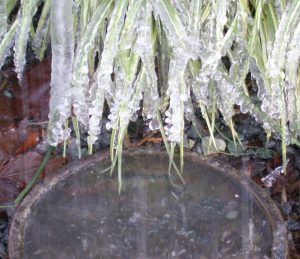 Plant roots that are fully hydrated don’t suffer the same damage by the ice crystals. In addition, soil water will hold more heat radiation from the sun than dry soil. So if a hard freeze is in the forecast, turn on the hose and give the plants adequate water but not so much that it doesn’t drain well. Roots that sit in water for long periods are more prone to disease than those in well-drained soil. In the fall, you want to clean up dead and diseased plant material, soil test and apply lime if needed, put on a light layer of mulch if desired, and keep an eye on drought conditions even during freezing weather. The garden will rest beautifully and be ready for your full attention in the spring. Photos courtesy of Jeana Myers.